Here, a cease fire is called so he could further instruct, or correct, whatever someone was doing that was stupid. 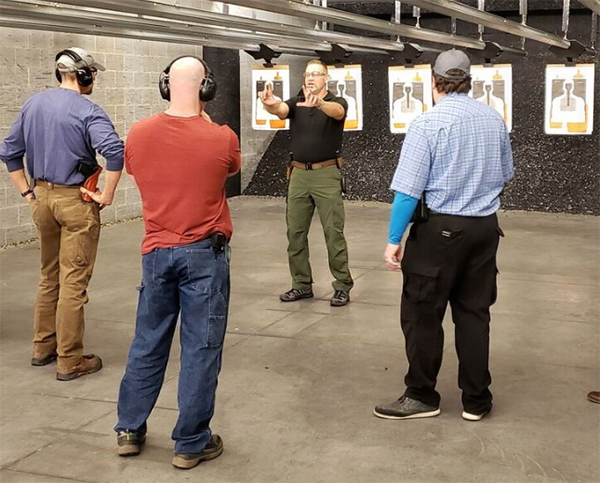 So I recently had the pleasure of taking Chris Cerino's Combat Pistol Course down here in sunny North Carolina. I say sunny as a pun, because it rained the entire weekend. Thankfully the class was indoors and I didn't have to train in the rain. After all, I'm not in the Marines anymore. Let me start by introducing Chris, who he is, and why I chose to take a class from him instead of anyone else. Chris is the real deal. I had been in the market to take a “more than beginner level class” for a while. But, with an imminent move from the northeast to the southeast, I figured I'd wait until I got down here, to NC, to find a class. Once I actually got down here, though, I was a little bummed that I couldn't find a whole lot of people who met my requirements to teach me. I have a bit of a unique thing going on in that I've been working for the gun industry for several years, go to the range to shoot quite often (except for the past 8 months or so), but that's the extent. A lot of the times I go to the range just to put lead on paper to test a gun out. I don't do a lot of real training, which is uber important if you want to save your own life one day. I needed someone who would understand my woes and be able to instruct me properly. There was nobody in Western NC that I felt fit that bill. Nobody that I saw, anyway. And in all reality, one of my main issues since I've moved down here, is that I've only been to the range twice and one of those times was for my concealed carry permit class. 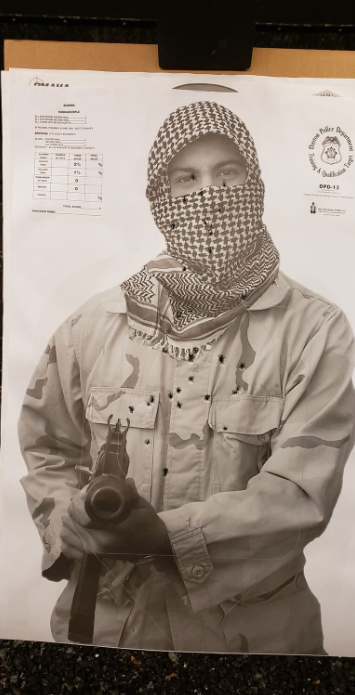 Before that I was packing, selling, buying the new place, getting down here, and focused heavily on that stuff so much that I can't even remember the last time I had gone to the range when I lived in Pennsyltucky. What that equals, is a lot of rusty skills and weak hands. 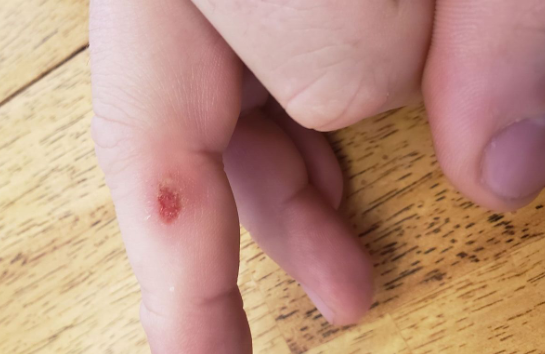 In fact, my hands were so weak that I was bleeding all over the bottom of my trigger guard halfway through the first day because my callus had softened into a blister that busted open. This was taken after I got home. A callus had softened over the past 8 months from lack of shooting and opened up. It was good training. It served as a juicy reminder as to why we are supposed to train hard and train often. When I say “train” I mean shooting from the drawstroke, and similar things, not just putting lead on paper from a bench. That's not training, that's target practice. And, don't get me wrong target practice does have value. I had looked for a class for several months and one day I saw that Chris Cerino would be down here teaching his Combat Pistol course. I watched Top Shot when it was on, and knew the name from other things going on as well. I told Jacob, Riley, and Matthew what my thoughts were, and I could tell from their reactions that I needed to jump all over taking this class, and I'm glad I did. 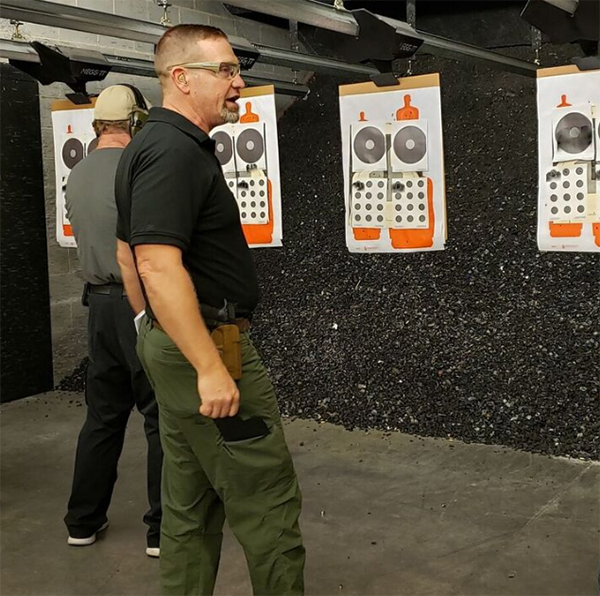 Even though it wasn't necessarily a point of the class, Chris helped all of us diagnose some of our core weaknesses to help us become more proficient shooters, both defensively, and from a marksmanship point of view. He also had us run some drills and do varying rates of fire shooting. This target was one where we were facing away from the target, sometimes with our arms crossed, other times looking at our shoes, or doing some other thing. We were timed and had to: look to the threat, face the threat, draw and present our weapons, and then place two shots to the chest and one to the head. I remember one of the group times for this one was 3:47, and I finished beforehand. Probably not the best time out there, but it was my first time doing the Mozambique from a 180 position (away from target) and I'm not a competitor. There is a lot that can go wrong in this scenario. There is foot work, drawing, presenting, etc. Chris, by the way, walks you through all that. One of his “Cerino-isms” as he lovingly calls them, is to step into the known. That essentially means, while every situation can be different, his first goal, or plan “a” is to step towards the known threat. He showed us how to do all of it. Here is Chris showing us one of the drills. And I mean he “showed” us how to do it all. He didn't have us do one thing that he didn't demonstrate for us first, himself. That's a huge plus to me because it helps build confidence in the instructor. If he/she can show you that they can do it, you can know that they can teach you how to do it, as well. I overheard Cerino telling one of the range employees (who just happened to be Gunny Brian Zinz, a Top Shop alum as well) that he went through over 500 rounds himself. He shot nearly as much as the students did. More than that if you count that he would occasionally shoot a student's gun to help diagnose if there was a problem with a gun or if they were jacked up in some way. Something that I thought was interesting, is that Chris doesn't like to use the term “stance,” as in which stance you go into when you shoot. Instead, he likes to use the overall term “platform,” as he calls stance a load of bull$#!t. To help prove that point, many of our drills and shooting was done with our feet together, touching, bowling-pin style. 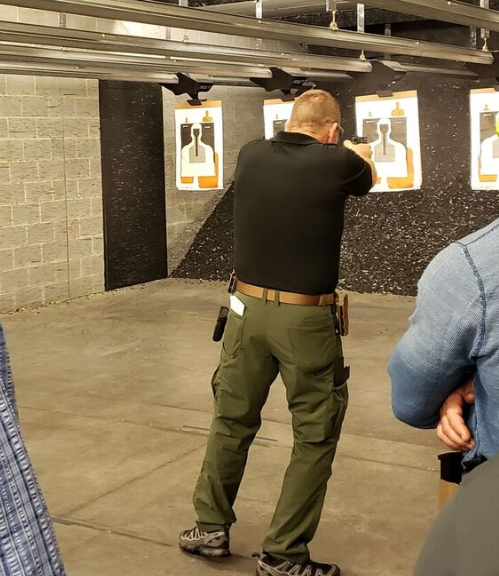 Because this was a combat pistol course, his point is that you won't always have the time to get into a proper shooting stance with your feet shoulder width apart. Sometimes you just have enough time to react and defend yourself. Wherever your feet are when that happens, is where they are when you defend yourself. You don't get the opportunity to ask the criminal to stop so you can make sure everything is in order to defend yourself. A lot of the time it's just a reaction. At the end of the day when the learning was all done we had a little competition where we would put a round on a dot with one in the pipe and an empty magazine (those dots were the bane of my existence, by the way). We'd have to run back to the plate rack provided by Newbold and knock down all the plates, then run back again to put two on center mass. At the end of the two days, I was exhausted. In fact, halfway through the second day I was exhausted. It didn't help getting a phone call from my dad that he was back in the hospital again for the second time in two weeks, and my shots were literally all over the place. Was the class worth it? I'd say so. Even though I was distracted by my dad being in the hospital again, wondering why he's back in again so soon and if he's telling me all that's going on, I feel as though my defensive skills have gone up. And, as I looked around at the other students, it looked like their skills increased as well. Nobody, besides Cerino himself, knew that I was writing this review, or that I even worked for the gun industry. Sometimes it's just easier that way, and that's why I don't have any student faces pictures, for their privacy. You can learn more about his classes on his website. Thanks buddy! It was a great class. Cerino can shoot!? Who knew? Sounds like a class worth taking. 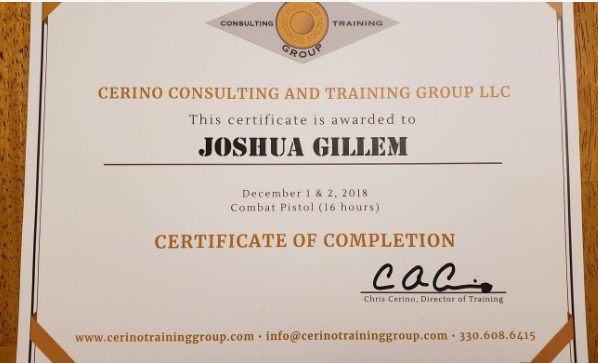 Josh, great to meet you in the Chris Cerino Combat Pistol Course last weekend. I really enjoyed the course, meeting all of the other students, as well as your write up / review. It really was and extensive training opportunity with top notch instruction. Any time you have the chance to shoot and learn from Chris and Brian Zins for 16 hours in two days – that is time well spent. All the best and I look forward to shooting with you again.